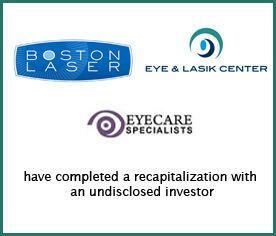 Boston Eye Group, The Eye & LASIK Center, and Eye Care Specialists have completed a recapitalization with an undisclosed investor. These three companies each provide comprehensive ophthalmic care for communities across Massachusetts. Boston Eye Group, founded in 2000 and operating under the brand names Boston Eye Group and Boston Laser, operates four primary locations in Massachusetts. The Eye & LASIK Center has been serving Franklin County for 50 years, now through eight locations. Eye Care Specialists has three locations, all of which are strategically located in close proximity to its referring hospitals. Collectively, the organizations employ over 30 doctors across 15 locations. Provident Healthcare Partners (“Provident”) served as exclusive financial advisor to Boston Eye Group, The Eye & LASIK Center, and Eye Care Specialists. The terms of the transaction were not disclosed. “Massachusetts is a very fragmented market for eye care services, and the recapitalizations of these three practices provides a great opportunity to create a leading ophthalmology provider spanning from Boston to Western Massachusetts,” commented Eric Major, Vice President at Provident. “Each of these three practices has an excellent reputation within the communities it serves. We believe these groups have found an excellent partner that will provide them with the resources needed to continue to grow and expand,” added Dustin Thompson, Vice President at Provident. “We are confident this transaction will give us the resources to build the type of organization currently needed to face the upcoming challenges in eye care. Selecting the ideal financial partner was of utmost importance to us. We are very satisfied with the outcome thanks to the market knowledge, advice, and diligent process put in place by the team at Provident,” noted Dr. Samir Melki, Director at Boston Eye Group. “Provident is a renowned firm with sophistication and dedication unlike most to help their clients achieve their goals. They are passionate about what they do and only have the highest caliber of experienced staff to work with every facet of your business,” stated Tracy Kenniff, Practice Administrator for the Eye & LASIK Center. Boston Eye Group, operating under the brand names Boston Eye Group and Boston Laser, is an academic private practice at the vanguard of eye care and patient service. Boston Eye Group’s dedication to research, education, and innovation are embodied in cutting-edge experimental studies, the publication of findings in medical journals and textbooks, and successful surgical breakthroughs. The company is comprised of 9 physicians. For more information, visit www.bostonlaser.com. The Eye & LASIK Center’s surgeons have over 75 years’ experience in cataract, glaucoma, and laser surgery. The company’s surgeons are board-certified and deliver superior ophthalmic surgery to the communities it serves. The Eye & LASIK Center has 18 ophthalmologists and optometrists. For more information, visit www.eyeandlasik.com. Eye Care Specialists has been a leader in comprehensive eye care for over 20 years. The company’s commitment to excellent patient care, in a calm, peaceful environment is the goal of each and every member of the Eye Care Specialists team. The staff is comprised of six ophthalmologists and optometrists. For more information, visit http://lasikeyesboston.com/. Provident is the leading investment banking firm specializing in merger and acquisition (M&A) advisory, strategic planning, and capital formation for healthcare companies. The firm has a comprehensive knowledge of market sectors and specialties, including the eye care sector. Provident also has unsurpassed experience and insight into the M&A process, which includes working with a number of buyers such as private equity firms and strategic groups. For more information, visit www.providenthp.com.